Invitations to this next phase of our public test are now being delivered to nephalem worldwide. If you've been invited to the Closed Beta, we'd love to hear all about your adventures on the forums, watch your live streams, and see screenshots and videos of your experiences in Sanctuary. Please keep in mind that Reaper of Souls is still in development, which means that all content in the Closed Beta is subject to change and isn't necessarily representative of the final game. If you're interested in participating in the Reaper of Souls Closed Beta, you’ll want to make sure you've opted-in for beta testing. 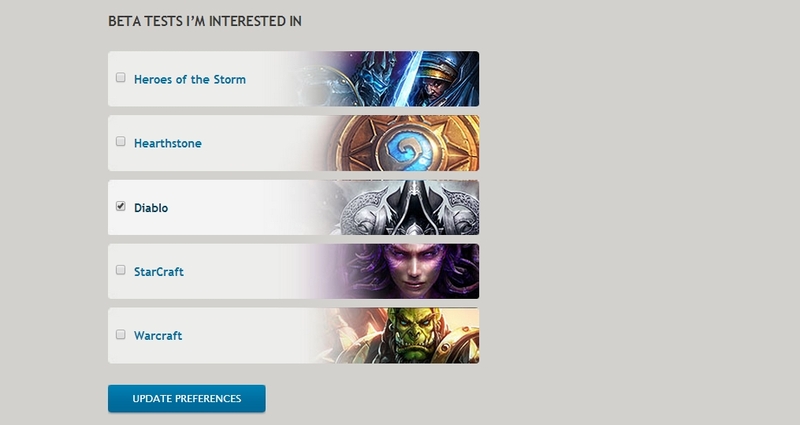 To opt into the beta, simply visit your Beta Profile Settings page in Account Management, check the "Diablo" box under "Beta Tests I'm Interested In," and then click "Update Preferences." In order to be eligible for an opt-in invite to the Reaper of Souls Closed Beta, you must have an active Diablo III license attached to your Battle.net account in good standing (i.e. not suspended or banned). Please note that opting in to the Reaper of Souls Closed Beta will not guarantee you access (especially since invites to our Closed Beta will be extremely limited), but it will at least give you a chance at joining our beta test. In the meantime, if you're looking to test out upcoming game features and provide feedback, we encourage you to join us on the Patch 2.0.1 PTR! Step 1: If you were invited to the Closed Beta via opt-in, verify that your account has been granted a Closed Beta license in Battle.net Account Management. If you were sent a Closed Beta key, you will need to add it manually by visiting the Add or Upgrade a Game page. Step 2: Download and install the Battle.net desktop application. Step 3: Once you have installed the Battle.net desktop app, log in with your Battle.net credentials and select "Diablo III" from the menu on the left-hand side. 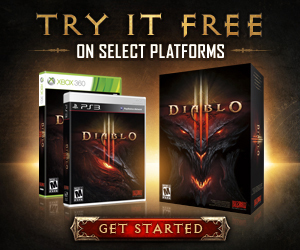 Step 4: On the Diablo III screen, there is a drop-down menu above the "Play" button (note that this may say "Install" if you do not have Diablo III currently installed). Select "Beta: Reaper of Souls" from this drop-down menu before proceeding. Step 5: You should now have the option to install and play the Closed Beta. Please note that the 2.0.1 PTR and Reaper of Souls Closed Beta are running on the same client and, as a result, participants will be able to interact and even play with one another. If you do not have a Reaper of Souls Closed Beta license attached to your account, you will only be able to access and test content available in patch 2.0.1. If you have a Reaper of Souls Closed Beta license attached, you will have access to all patch 2.0.1 content as well as expansion-only content including Act V, the Crusader, and Adventure Mode. If you previously had access to the Friends and Family Beta, you will automatically be granted access to the Closed Beta. The option to copy your existing Diablo III characters from your live account to the Closed Beta will be available and can be done directly through the Closed Beta client. Step 1: Log into Closed Beta client and create a level 1 character. After you're done, return to the main character screen. Step 5: You may be disconnected from the Closed Beta client. In addition, you can only copy characters over to your Closed Beta account once every 72 hours. Attempting to copy characters before this cooldown is up will result in an error. For those who have received an invite to the Closed Beta, we thank you for being a part of this important stage of development! Once you've had the chance to try things out, be sure to visit the Reaper of Souls Beta forums to discuss the expansion. Note that all forums listed below will require a Closed Beta license in order to post. You're also welcome to email feedback directly to ROSBetaFeedback@blizzard.com. If you’d like to submit a bug report, please send it to ROSBetaBugs@blizzard.com. As this is a test server, please anticipate uneven game performance, and note that restarts and downtime may occur without warning. We'll provide information regarding extended downtimes, should they occur, in the Reaper of Souls General Feedback forum. How can I opt-in to the Closed Beta? To opt into the beta, visit your Beta Profile Settings page in Account Management, check the "Diablo" box under "Beta Tests I'm Interested In," and then click "Update Preferences." In order to be eligible for an opt-in invite to the Reaper of Souls Closed Beta, you must have an active Diablo III license attached to your Battle.net account in good standing (i.e. not suspended or banned). Please note that you may need to download and run the System Check tool in order to update your Beta Profile preferences. Beta testers are chosen according to their system specifications, in-game activity, and other factors, including an element of luck. How will I know if I'm selected to participate in the beta?? If you are selected to participate in the Reaper of Souls Closed Beta, you will receive an invite via email. Opt-in invites will always be sent to the email address associated with your Battle.net account, while Closed Beta keys may be sent to other email addresses. To help avoid phishing attempts, if you believe you've received an invite to the Closed Beta, it's best to refrain from clicking on any links in the email(s) you receive. If you received an opt-in invite, you can verify that your account has been granted a Closed Beta license in Battle.net Account Management. If you were sent a Closed Beta key, you can add it manually by visiting the Add or Upgrade a Game page. Will there be any other ways to get into the beta besides opting-in? In addition to opt-ins, we are also inviting key community influencers from around the world on a case-by-case basis. Invites to the Reaper of Souls Closed Beta will be extremely limited, however, and opting in to the beta is your best way to get in. Players who participate in the Reaper of Souls Closed Beta will have access to all content in the expansion, excluding the final boss fight. For an overview of testable features in the Closed Beta, please see our patch notes [link]. What languages will the beta be available in? The Reaper of Souls Closed Beta is currently available in English and Korean. There is no non-disclosure agreement (NDA) for the Reaper of Souls Closed Beta test. You are invited to take screenshots, livestream your play sessions, record feedback videos—whatever your heart desires! Please keep in mind that the game is still a work in progress, and we appreciate your understanding when you encounter bugs, graphical errors, or other issues. Neither the gold nor the real-money auction house will available in the beta.